One short year ago, home energy assessments seemed as familiar to me as the surface of the moon – a moon with solar panels. We had recently purchased a fifteen year old home that was in grave need of updating. Obviously, focusing on standard paint and flooring was a priority but we wanted to treat the whole house, not just certain parts. With dated HVAC (Heating, Ventilating and Air Conditioning) units, original aluminum windows and the increasing cost of energy, we brought in Alternatex Solutions Owner, Sam Florence to perform a no-cost energy assessment. He began his thorough inspection by asking a series of basic questions. How much are you spending per month on electricity? Does your home stay the temperature you would like year round? Is there an area of your home that never seems to heat or cool? Do you notice a large amount of dust on surfaces? This brief conversation instantly piqued my curiosity (along with his infrared camera) and our journey to an energy efficient home commenced. In the following weeks, we worked with Florence on developing the best energy plan for us, based on our home’s needs. I’m certain I had a deer-in-the-headlights look on more than one occasion. It would be misleading for me to say I wasn’t initially skeptical. What is the overall cost? How long will it take to see a change in our monthly expenses? We discussed all aspects of increasing the value and comfort of our home, everything from energy efficient windows, duct sealing to decrease air leakage and solar panel solutions to eliminate energy costs. We purposefully worked to familiarize ourselves with every detail of our space, viewing our home as more of a long-term asset and less as a short-term expense. Produce our own electricity? Decrease my frequency of dusting? Eliminate my need for shorts in one room and a sweater in the other? I’m in! Like many other homeowners, I was acutely unaware of the message my home was sending. I was unequivocally fashionably late to this party. The illustration below contains my aha moments, answers to questions I never knew to ask. HVAC Assessment – Diagnosing everything from leaks to pressure balance in your vents can save you substantially on your monthly electric bill. This will also determine if your unit is the right size for your home. 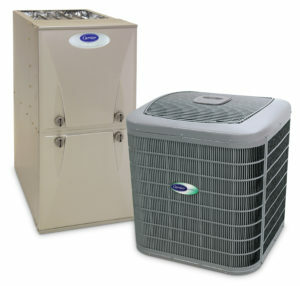 An oversized unit can run less, leaving excess humidity in the air. More than 50 percent of an average electric bill is HVAC costs. Who knew? 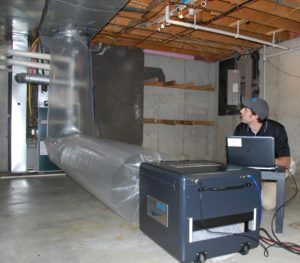 Duct Sealing – Duct leakage can be a huge issue in your system’s efficiency. The average duct leakage in Texas is 30 percent. This process will also significantly decrease the dust accumulation on your surfaces and the technology is incredible to watch. Insulation (insulation & radiant barrier on one image) – Adding insulation can help control temperatures, moisture and sound which are all pluses in my book. Radiant Barrier – This thin, lightweight material reflects 97 percent of radiant heat coming in your attic. From a woman’s perspective, it practical AND pretty. 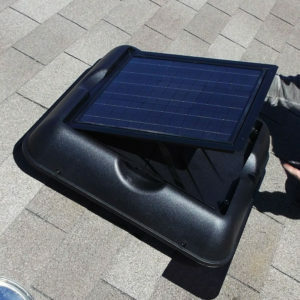 Ventilation – Proper ventilation pulls heat from your attic. This is crucial with radiant barrier to remove the heat it is reflecting and trapping. This also reduces moisture in your attic. Look out mold and mildew, here we come! 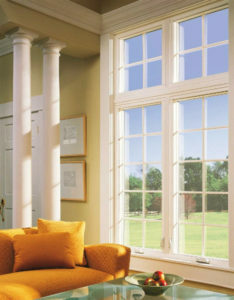 Replacement Windows – Efficient windows can save money but they can also reduce the damaging effects of the sun which lead to faded floors and furniture. No more rearranging the living room every few months to preserve your beloved sofa. 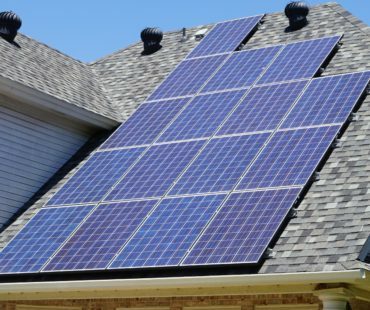 Solar Panels – These dramatically reduce electric bills, increase property values, allows eligibility for federal tax credits and requires very limited maintenance. They literally and figuratively elevate your home to “cool” status! In one short week, I experienced a beehive of activity. 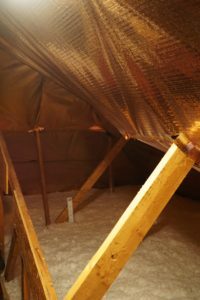 With replacement windows and solar panels installed, HVAC ducts sealed, radiant barrier applied, and extra insulation in the attic, my head was spinning. I’ve never seen people work so quickly in my life. Many electric appliances were converted to gas and all light bulbs were replaced with LEDs, which resulted in the purchase of a fun light bulb changing contraption for high ceilings. LEDs also attract less bugs which was an easy sell for me. 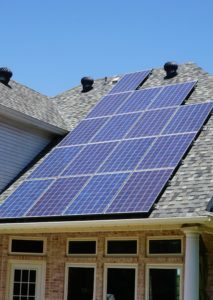 We saw an immediate and substantial change in our monthly energy costs, as much as 99 percent. Improved air quality and overall comfort of our home (which I now refer to as our lean, mean, efficiency machine) has dramatically changed but there’s so many more benefits to consider. Substantial federal tax credits, rebates from gas and electric providers and hedging your future energy costs are additional advantages. “People typically don’t prioritize investing in the heart and soul of their home,” says Florence. While we’re enjoying our new paint, flooring and I change light bulbs just because I can, the overall health of our space has been an invaluable investment. Not everyone can relate to our energy efficiency journey but we can all relate to saving money. It’s a universal language! For more information, visit alternatexsolutions.com.